1. What is orthodontics? How does it differ from conventional dental practices? Orthodontics is a division of dentistry, which deals with the diagnosis and providing therapy for problems faced due to teeth and facial irregularities. Orthodontics is a specialization and not all dentists are orthodontists since it requires an additional knowledge and advanced study on orthodontics which is achieved by only 5-10% of dentists overall. 2. Who should consult orthodontists and what is the ideal age for general consultation? Anybody with an asymmetrical dental and facial structure can consult orthodontists. However, the ideal age recommended is as early as 7 years because the earlier a problem is detected, the easier it is to obtain a solution for it. At Apollo White Dental, we insist on “Look before you Leap”. 3. What are the causes of orthodontic problems? Can we avoid it by taking precautionary steps? Partially, YES. You can avoid it by avoiding practices like thumb/pacifier sucking at childhood. But in most of the cases, the problems arise due to accidents, inherited genetically like crowding of tooth and other irregularities related to jaw and lips. 4. Why is orthodontic treatment necessary? Who doesn’t want to feel lively, energetic and full of confidence all the time? Also when there are orthodontic problems, people may be subjected to pain in gums, decaying of tooth and other dental related issues. At Apollo White Dental, a bright and happy smile is what we promise to you. 5. What would be the cost of an Orthodontist treatment? The cost of the treatment varies for different dental issues. At Apollo White Dental, we recommend the patients to schedule for a thorough initial examination in order to analyze, assess and detect the exact dental issue, thus paving way for the orthodontists to come up with the type of treatment and cost for the same. 6. What will I get to know from the initial examination by an Orthodontist? Once you go for an initial examination, you’ll get to know about the prevailing orthodontic problems, treatment for the problem detected, the duration of the treatment and the cost for the entire treatment. In short, we provide you a full, thorough analysis of your condition. 7. What is the duration of the treatment? The duration varies for different cases. It depends on the severity of patient’s orthodontic problems. However, the average time period involved in the treatment would be 8 to 30 months. 8. What are the most common orthodontic problems? The most common orthodontic problems are overjet/protruding tooth, crowding, deep overbite, spacing, crossbite, lower jaw protrusion. However, we recommend you to schedule an appointment and consult the orthodontist for other extensive details. 9. Do braces hurt? What are the restrictions for a patient who wears braces? Most patients experience a sense of pain for 2 to 3 days. After few visits to dentist, the patient no longer feels the soreness. The restrictions will be mainly based on food intake for the maintenance of braces. They will be clearly explained in person. After putting on the braces people are generally advised to brush twice a day. 10. Can you tell me about Emergency Appointment and its significance? There may be a situation where braces could have been broken, or may be causing you an unexpected pain. In those times, we offer emergency appointment to help serve you quickly by fixing an immediate appointment for you. However, we will guide you through telephone in most of the cases. 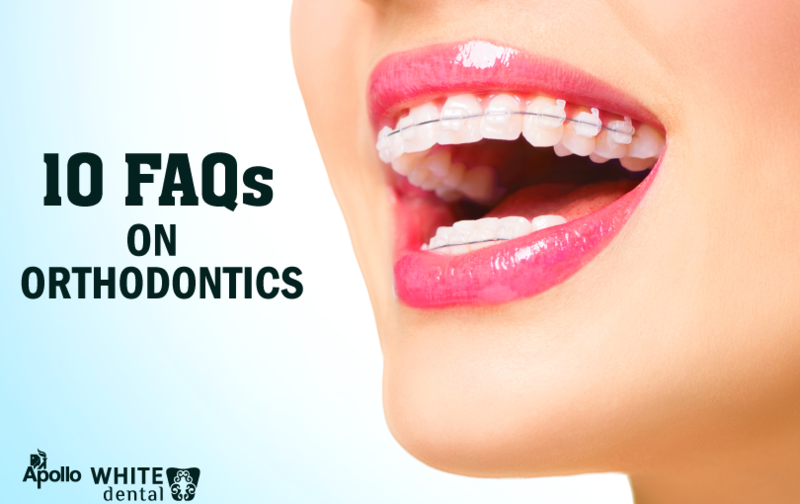 We hope these FAQs will surely help you take a better decision and get back your flawless smile. If you still have doubts, feel free to call us at 18001-02-02-88.